snowdeal.org > ex machina: fiery hot habaneros! 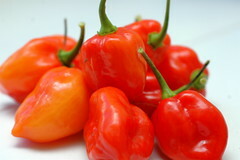 forget those red hot chili peppers, the habaneros from the garden are the real deal. pure, unadulterated hotness. this batch is going to be used for the inaugural batch of odin's organic "kick in the asgard" habanero hot sauce.